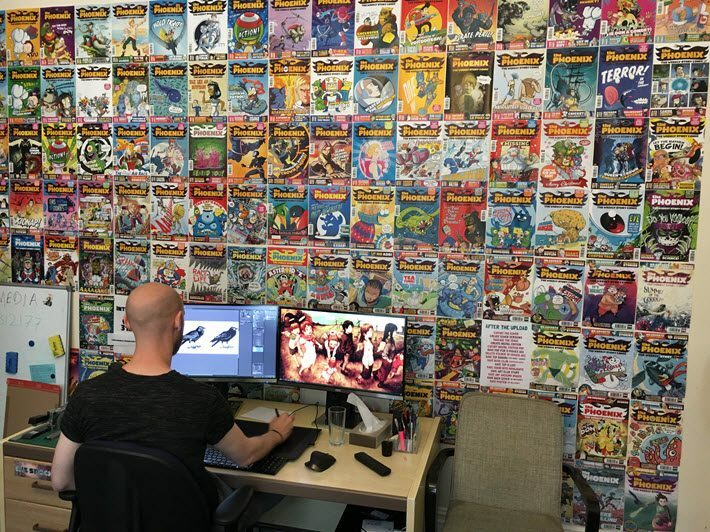 The publisher of children’s comics magazine The Phoenix is looking to expand the business with global distribution, bigger subscriber base, and rights deal. The Phoenix is my 7-year-olds favourite comic. So it was great to be able to interview its ambitious editor for the New York based Publishing Perspectives which you can read in full below, or the original by clicking on this link. 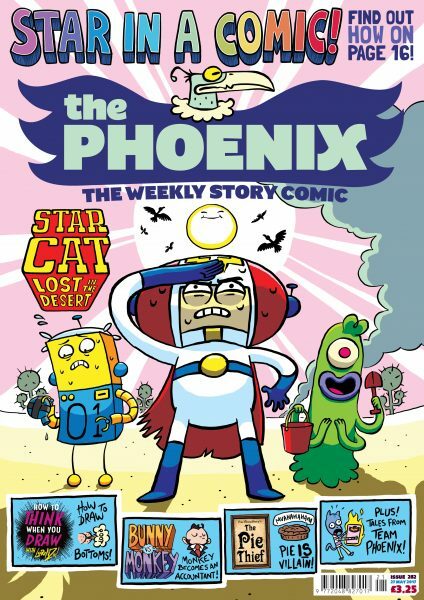 Aweekly comics anthology that’s set to publish its 300th edition in September, The Phoenix has a monthlong promotion ahead at the UK’s ubiquitous Sainsbury’s supermarkets. And offshore expansion is on its managing director’s mind. “We do have overseas customers and we can ship anywhere in the world,” Tom Fickling tells Publishing Perspectives in a conversation at his offices in central Oxford. “But what we want to do is set up a printing operation in each country we ship to. Launched in 2012 the comic, which characterizes itself as “the weekly story comic,” has a circulation of 9,000 units per week, a number Fickling says is rising quickly. Fickling says another of his current projects involves developing partnerships with literacy charities such as National Literacy Trust and Book Trust to explore the role comics can play in getting children reading. The Phoenix is the brainchild of Tom’s father, David Fickling, publisher of Oxford’s eponymous David Fickling Books. The intent was to resurrect the British adventure comic, which faded with the closure of Eagle in 1994. In 2008, the elder Fickling launched a similar comic called The DFC with Random House. Although it was forced to close 43 issues later, he didn’t give up. And Tom left a career in the film industry to return to the family business. 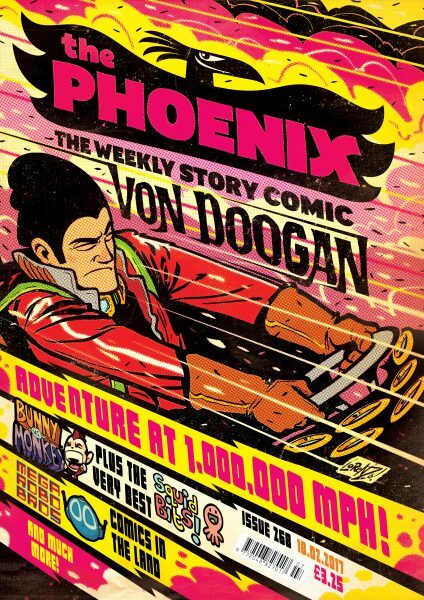 The Phoenix sets itself apart from other children’s comics on the newsstand, in part by what it doesn’t do. It doesn’t carry advertising. It doesn’t use expensive-to-licence brand names. It doesn’t tout free promotional toys on the cover to boost sales. And, in fact, it isn’t on many newsstands. Because of promotional costs, it’s usually available only in the up-market supermarket Waitrose and at High Street retailer WHSmith. Instead, Tom Fickling says, The Phoenix invests in the content needed to drive the subscriptions that fund it. The success of this approach can be seen in a high conversion rate of trials into paid subscriptions–85 to 90 percent, he says. The magazine also is represented at schools with a touring show that encourages children to be creative. “The vast majority of our customers are subscribers to the magazine,” Fickling says. “Magazines had subscriptions before, but over the last five years the concept of what a subscription is and how it works has changed because of Netflix and Amazon. The Phoenix also has sold more than 100,000 comic books–editions published by David Fickling Books mostly in the UK but with small percentages of sales coming from Australia, New Zealand, and South Africa. In the States, the books are published as a trade imprint by Scholastic. “Comics have had a pretty bad rep for the way they treat creators,” Fickling says. “So when we work with outside creators, it’s important that their feeling of ownership over what they have created is recognized. “The proportion of the IP [intellectual property] owned by the magazine and owned by the outside creator is about a fifth to four-fifths. “Even with the properties we own, our team will share in the rewards if we become the next Marvel. We’re developing a cartoon strip internally at the moment–and if that gets made into a film then the person who drew it is going to do really really well–as they should. In terms of profitability, Fickling says, the business may not be as flush as some think. “The authors get a royalty just like a book,” he says. “They’re also expensive to print because they’re published in full color and printed in the UK” for the British market. “In terms of revenue, subscriptions are 85 percent. And the comic is at the heart of everything. Without The Phoenix we couldn’t afford to do the books. It allows us to keep getting new material and turning it into books. “There’s massive growth potential in books,” he tells Publishing Perspectives. “In the UK, we’re trying to build a book market that some people feel doesn’t exist. There are some major bookstores that I won’t name who don’t really support our books. “But the tide is turning. In America, Scholastic sells hundreds of thousands of children’s comics and graphic novels every year. Random House has brought Hi-Lo over here. “We’ve sold the rights of Corpse Talk No. 1 into to Poland,” Fickling says, ‘and the syndication rights for The Pirates of Pangaea into Spain. Again, this is an area that we’d like to grow because these are thriving comic-book markets [but] there’s a danger of trying to do everything. The Phoenix only has four full-time staff including myself. “Let’s remind ourselves that the most important thing is that each week we make the best comic we can. Patience, however, doesn’t mean that new developments aren’t welcome. “Film production companies have also started to show an interest in some of the strips,” he says. “The creators are delighted. I’m more cynical, having come from the film industry. “I can’t imagine that we won’t develop more comics,” Tom Fickling says. “What about children aged between three and five? What about teenagers? Previous What do small medium businesses have to fear from WannaCry and the Vault 7 leaks?